I can't remember whether I talked about this in the podcast, but here goes anyway. I found the transition from poetry to short stories much, much easier (and by that I mean more intuitive) than from short stories to novels. I'm still not exactly sure why that is. There are the obvious answers, I guess, about concision and use of images. But I think the influence goes deeper than that--and isn't readily explicable. The thing is, my poetry, and the way that I look at poetic's role in the world, has radically changed since I got my MFA almost 10 years ago. Which is definitely for the best; I wouldn't to be writing the same material over and over. 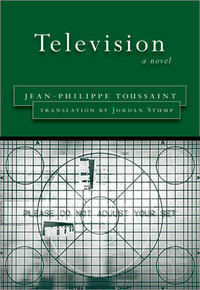 The type of surrealism and absurdism that I was coming to terms with in my MFA years--which I do think really influenced my early short story writing efforts--involved word-play, for sure, but had more to do with working inside the confines of the mainstream lyric, even if it was a push against the lyric form (oftentimes, with the formal constraints of the sonnet and sestina). I was trying to write material that embodied how I felt, and to really grapple with how language could become a code for how I felt. Which were good lessons. I quickly found that speculative and fabulist fiction could also use language as a code--to do more than drive forward a narrative. Narratives took a long time for me to feel comfortable with! The imagism of a striking metaphor, at times, became a kind of substitute for narrative in my earlier stories. But something else was changing too, and I was beginning to realize how little I knew about poetry, even after devouring it for two years straight. There were all of these other traditions and counter-traditions that I In a way, the experience was similar to burning out on Dragonlance novels in my adolescence--I kept seeing the same tropes retread over and over again, and I wanted more. There are, of course, poets that I really still admire and read avidly from 10 years ago, and have seen with new eyes as I've grown older--Keats, Frank O'Hara, Larry Levis, and (perhaps most specially) Lorine Niedecker--but once I realized that there were other arguments about what poetry could do, what it could embody in the world, it was like the floodgates opening. This is in, what, 2000 or 2001, in earnest. So my poetry reading was going to go into a kind of haphazard, ahistorical overdrive--older poets like Charles Olson and Louis Zukofsky, and more contemporary writers like Lisa Jarnot, Jennifer Moxley, Kevin Davies. The real catalyst came about when poets began blogging in late 2002 in large quantities, and it was exciting to see books come out of writers whose voices I'd come to trust, even if I didn't agree with them all the time. Anyway, I don't know how much this time-pinpointing is helpful or interesting. But this was also the time when I really feel like I started to start "getting it," where I felt a little more comfortable in my writing skin and less willing to try different modes of storytelling simply for the sake of it--rather, I was beginning to understand a little more how to let the voice come to me rather than the endless pursuit of a voice. Okay, I'm still not sure what that means exactly, but I hope that's a useful thumbnail image. I also began to feel more comfortable in moving away from genre "set pieces", even if the stories had certain elements of genre at play. Which is a roundabout way of saying, I think, that the poetry reading and writing that I was doing post-MFA was beginning to have an effect on my fiction--but not in sense of a specific technique, but rather a mindset--or let's even call it a position--that I wanted to take with my writing. That I wanted to push myself into real engagement with the world, and how I was situated within it. Sometimes, but not always, that led to a more political type writing; it also, for sure, helped open up the aversion to philosophy that I'd harbored for some time, and began to read philosophers speculatively, in ways that could open up new ways for me of looking at both writing poems or stories. These are obviously tenative baby steps, and when I mention being "comfortable" earlier, I should make it clear that this involved being comfortable with being uncomfortable. And so it comes back to emotion, and in a weird way I feel a bit like I've come full circle since when I was 15 and writing poems and stories as a tonic to alleviate my misery. The emotional responses that I write about are part of the world, and part of my engagement with it. This isn't a move toward easy therapeutic confessionalism, but rather to be unafraid to use my self as material, halfway between the public ambulatory life and the private sphere of my own thoughts. To see my imperfections and faults as, perhaps, codes themselves that can at one point be reinterpreted on the page as hope. This sea change doesn't recognize the difference between poetry and fiction. It's more of a matter of emphasis. One isn't inherently more "useful" than the other to keep pushing forward with these things. And now as I'm pretty much relearning everything again to write a novel or two, the scale is vast enough that the prose can be a repository of both the poetic and the narrative. The novel is definitely an open question. I have to be honest: I've got some problems with the title story. But not problems in the usual way, the way we say we've "got problems" with elements of a story when discussing it in a writing workshop or something. Mine aren't the sorts of problems that affect whether I'd say I like the story or not (in general, I'd say I do like the story), but they are the sort that keep me from fully embracing it in the way I do some of the other stories in Skinny Dipping in the Lake of the Dead. For instance, I have a problem with the story's dates. It is set a few hundred years in the future -- one footnote gives a book's date as 2276, another footnote lists the abandonment of Oil City as 2136. Most experienced science fiction readers don't take dates very seriously, because most science fiction stories use their dates simply to suggest the amount of distance the setting is supposed to have from our own present. Thus, the dates in "Skinny Dipping" aren't suggestions of what life might Really Be Like a few hundred years from now, but rather signposts saying: We are far from Now. Except we aren't. And that's the problem. (To some extent or another, it's the problem of all science fiction that attempts to be comprehensible to a contemporary audience. A rigorous speculation of the far-future would be mostly nonsense to us, because culture, language, and technology all change rapidly. The distance between the latest date in the story, 2276, and us is the distance between us and 1738. What would, say, Samuel Johnson be able to comprehend of an essay written today?) Certain technologies in "Skinny Dipping" have changed significantly from our own, but plenty of things remain the same, including Federal Express and Billboard magazine, high school, email mailboxes, and college application essays. People's assumptions about the world seem basically the same, if a bit more corporatized. The language is that of contemporary American English, plus some neologisms. Clearly, then, the story is not meant as a rigorous speculation about the possible future. It would be silly to read it as such. And that's fine. But those dates -- they bother me. Why a somewhat distant future when a nearer future would be more plausible, more acceptible? Is the story itself a comment on the tendency of many SF stories to throw distant dates around without thinking much about them? Does it matter? I really don't know. I have a problem, too, with the audience the narrator is addressing. The story is supposed to be a college application essay, and yet it spends a lot of time describing the world to us. The explanations of Oil City and such in the story suggest we don't know anything about these places. This isn't necessarily the same problem as the problem of the dates -- it could be that Oil City is not generally known, or that in this world information about cities is something that is provided as a way of showing college admissions offices that you are capable of doing research, or something like that. It could be the footnotes were added by an editor at an even more future date. Plenty of possibilities. But my problem is that I didn't find any hints to help me figure all this out. So I'm left with the possibilities, but not in a particularly good way, the way I like, for instance, some ambiguity in fantasy stories. And perhaps that's my biggest problem -- I keep trying to read this as a science fiction story, a story that is basically rational. If I were to read it as pure surrealism, say, would I have these problems? And what is it that keeps me from doing that? Sometimes, we read stories like "Skinny Dipping" as amusing satires. And there are satirical elements here, certainly. I guess I just don't like them very much. I'm more interested in the other elements, and those elements are the ones that keep pushing me toward trying to make sense of things. After all, the reason characters can breathe in the Lake of the Dead is because of gene therapy and nanotechnology. In "If I Leap", the characters can fly because they can fly. That's a different sort of story. My problem is I'm more comfortable with stories that aren't so rational. My problem with rational stories is I want them to be entirely rational. I'm not sure I should take my problems out on stories like "Skinny Dipping in the Lake of the Dead", but, well, sometimes I do. John asked in the comments what's on the horizon. I have a novel that I finished more or less recently called Total Oblivion, More or Less, which is, in lit-mag bio-speak parlance, "currently seeking a publisher." Although it's not directly related to "Our Byzantium" in any way, the geopolitical dynamic in the story is more or less the same, with Scythians, Thracians, and other assorted tribes invading the U.S. and transforming it, with a counter-invasion by a Byzantine-like Empire. Well, that's the premise, anyway, but it mostly involves a family that is trying to make its way downriver during this chaos. I'm working on a new novel, now, which I'm in the thick of, and my grasp on its properties is far more tenuous! It's called World Fantasy, and is shaping up to be about (or "about") the Unicorn Tapestries, terrorism, MMORPGs, Minneapolis, big box retailing...and about 20 other things, it feels like at this point. I'm writing it in Google Docs,--which has been an...interesting experience--in seven parts, with seven chapters in each part. That's the plan, at least. Has anyone else worked extensively with Google Docs? It's been pretty much fitting my needs, but it might be the nature of the project, and might not work as well for something that has longer pieces of text, or more complicated design needs. 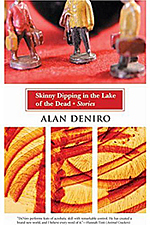 The following is an interview with Alan DeNiro, author of two chapbooks of poetry: The Black Hare and Atari Ecologues, as well as a collection of short stories, Skinny Dipping in the Lake of the Dead (Small Beer Press, 2006). Thank you, Alan, for taking some time from your schedule to answer some questions. You attended Catholic school for 12 years – I’m assuming 1st grade through graduation. Have you determined if, and if yes, how, those years may have had an effect on the way you write? Yes – a huge effect. It gave me a cosmology and belief system to work with, and later, work against to an extent. I still feel “culturally Catholic” in spirit, in a lot of the ways I approach looking at aesthetic issues of politics (e.g., the storytelling of the saints’ lives). I also have written a lot about people grappling with religious experiences – and there are no easy answers to such things. Growing up, I really did believe. You received you BA in English from College of Wooster and then your MFA in Poetry from the University of Virginia. Did you go right from Wooster to the MFA program, or was there any time spent out of school in between? I went straight through. Definitely a different experience than most of my colleagues, who were generally older. Your most recent published book is a collection of stories, and per your website, you’ve published many more than are included in this book. Did you also take any fiction classes during your MFA program, or just poetry? Tons. I really have an island of misfit stories on my hard drive. Sometimes it's a story that has to just germinate/marinate for a while before something pops up, as a way to finish it. Sometimes the impulse to finish a story comes completely out of left field. I also have notebooks of fiction; up until I got my ibook about a year ago, I wrote nearly all my first drafts in longhand. So even now I flip through those notebooks every once in awhile, parsing through half-finished narratives and seeing if anything can be salvaged into something fuller. Oftentimes, the fragments are authentic--that is, coming from an authentic emotional place--that just need a little prodding. Here's an example, and I thought it might be interesting to bring up since the story ("Plight of the Sycophant") has just been published, in Logorrhea, an anthology that just came out from Bantam Spectra, edited by John Klima (who's been seen here in these here parts!). It's an anthology of stories based on words that have won national spelling bees. Very cool idea. John had sent to potential contributors a list of spelling bee-winning words. Fumbled around with a couple of ideas (which--surprise!--elicited a few unfinished early stabs o' fiction on my part, including a giant robot story set in Iowa, which I'd love to get back to at some point. Anyway...). Then flipped and flopped through my notebooks. Came across a draft of a story which I had forgotten about, which was technically "finished" but had a half-assed ending that I really wasn't happy about. But there was something there in the story, even still. Read it again. Read the list of words. And "sycophant" jumped out at me. Because it really was a story about a sycophant, even though I didn't know it at the time. So one weekend I pulled out the notebook and my laptop and started getting at it, with the word SYCOPHANT like a neon sign in my head...which would hopefully illuminate nearly every part of the revision process. It really was a total overhaul of the story. That word gave a platform for exploration, to dig deeper in what the character was dealing with, and allowed for an ending that I was much, much happier with (the last few scenes weren't in the little notebook at all). So how much of the misfit-toys version of the story made it into the final version? I'm not sure. It was a foundation, but a very porous foundation. But sometimes those are the kinds of drafts that let you become surprised down the road. I just got a copy of the anthology a short while ago, and it is very wicked cool. Do check it out if you get the chance. Especially if you are a word freak of some sort. Which, I'm guessing, a lot of you are. So even though none of my space opera made it into the collection (the flow between stories, perhaps; or wanting to collect all of the space opera together at some point), it's still part of the fabric of what I write. Questions find different ways to be written, and characters--often with conflicting or contradictory questions--are going to stumble around trying to answer them. Any time. Any place. Finally, I think that, in the course of pushing oneself, it can be very helpful to court embarrassment. (Does Battlestar Gallactica change this dynamic? I'm not sure. Maybe.) That is to say, if what you write about seems, on one level, spectacularly ridiculous to you, and yet still sparks your prose wildly onward, you might be onto something. And, really, there are few things more absurd than faster-than-light travel. Alone, either plot might be fine. The Byzantium plot could be a good, funny story, akin to Carlson’s. The story about how the narrator tries to figure out why he is more attracted to the elusive and unavailable “you” than to the present, kind, and pretty Jerilynn (who has her own unavailable object of desire) might have been a sweet tale about our fickle hearts. Together, they are magical, poignant, and, because of the constant threat of violence from marauding Byzantines, not too sentimental. And then, there is this lovely moment near the end. “Yeats had it wrong,” DeNiro writes. “This is a country for old men.” I love a nice allusion and when a buried one emerges and enriches, well, then I’m doubly pleased. 1. What does the title "Child Assassin" refer to? 2. Why is it significant that the protagonist does not have a name? 3. How are the other things -- "cars, books, toys, grandmothers, yachts, dogs, an eighteenth-century Persian writing desk, parakeets, anacondas, Winchester rifles, stuffed polar bears, ice-cream trucks, oboes, a ten-acre field of marijuana, and so on" -- are "babies" that the protagonist also kills. 4. Discuss the final paragraph. Is it a metaphor? 5. Explain how these questions reveal nothing about the experience of reading this story. Again and again we hear that the best fiction, the best poetry, the best music, the best this-that-or-another-thing is best because it cannot be summed up or reduced to anything other than what it is. "If I could have said it differently, I would have," the creator claims. Maybe I'm cynical (maybe?! ), but often I wonder if this is really the case, or if the truth isn't something closer to: "Look, I've only got certain talents. If I could dance, I would have put these impulses into a dance. But I can't dance. I'm a carpenter, so I built a house instead of dancing." But with a story like "Child Assassin", I cannot come up with any way to describe it that encompasses all the story is. I don't know how to reduce it to something other than its own particular expression. And many of its particular expressions are quite wonderful, for instance: "The tremors of their voices were on the furthest edge of comprehension, resembling the speech of minor earthquakes or lichen cellular growth." I love that sentence. The first part is familiar from many other stories and books, but the second part goes off in a direction few other writers would even notice, never mind head toward. Which is just a roundabout and not very precise way of saying the last pages are up to a lot, and the last paragraph, which states so little and implies so much, comes awfully close to perfection. What are your opinions on writers being pigeonholed into specific categories? By chance, have you seen the Best American Fantasy collection? If so, what do you think of it? I think the pigeonholing can sometimes happen, to an extent, as part of an end product with a finished book. But for me, good writing always transcends demographics. During the writing process itself, I try not to worry about category--sometimes there are specific tropes that I like a story or novel to snake around and get inside of, but those are permeable. There's this quote from the poet C.D. Wright that I've always loved: "We are indispensable to one another. We keep the language machine going. Often in different directions at once. And the behavior of language is such that parallel concerns and sympathies are available to serious practitioners on many levels, at any point in space and time--the formal, the inventive, the revelatory, the message plane itself." I think this is the best way to ensure that writing doesn't become a kind of lifestyle accoutrement. I haven't read the Best American Fantasy yet, but am really psyched to pick it up, probably at Wiscon. The wide range of venues that the stories were taken from is simply astounding. I almost never work on fiction and poetry at the same time, though over the years the two have been drawn together much more closely, so that (in my mind) there's less of a barrier between the two. For a long time it was my poetry (since that was what I received my MFA in, and what most of my "training"/reading was in) influencing my fiction, but in the last couple of years I've found myself in a place where my fiction has been influencing my poetry more. I'm not sure exactly how, necessarily. In the long poem that I've been working on called The Stations, I have these interspersed prose-poemy/New Sentence-like prose sections...those are definitely coming from the kind of syntactical leaps that are bread and butter in science fiction and other forms of fabulism. So I've been finding ways to let them influence each other and for the most part they play nice. For this new story I'm working on, I have been writing ghazals that are interspersed throughout the story, that provide kind of a (okay, cryptic) metacommentary on the narrative at large. I'm not entirely sure whether I'm going to keep them or not in the final draft but the ghazals have been definitely useful in figuring out what's important and what's not important in the story. I don't know if I'm the best person to answer this; I don't really read either Sunday paper in town. I do like the book coverage in City Pages. I feel really lucky to be able to write for Rain Taxi, and to live in the same town where it's based; they do a fantastic job bringing writers of all stripes to the Twin Cities to read and interact with readers. I do agree with what a lot of people say: that the cuts in book coverage have more to do with newspapers in general than books in general.